Fine Creek Realty was formed in January 1989 by Jim Blandford who had been in the Real Estate business for the previous 15 years. Jim is still the principle broker. The business operated from a small house on Rt. 60 in Powhatan. Jim Blandford, a third generation native of Powhatan and a graduate of Hampden-Sydney College, had the real estate background with 15 years of selling properties in Powhatan and surrounding counties before founding Fine Creek Realty. Charlie Shiflett brought the entrepreneurial spirit to the table having run a tennis operation at Virginia All Weather Tennis facility, owning and operating a thriving restaurant in the heart of Powhatan and selling real estate for 4 years before joining Fine Creek Realty. John Gardner brought a strong financial background to the table. After graduating from then RPI (now VCU), John started a career in banking working his way to become the President of Suburban Bank in Henrico. After banking, he started a new career in real estate with 3 years experience before joining Fine Creek Realty. Along with these three Gloria Lathrop, Bobby Hertzler and Ewell Flippo joined Fine Creek Realty. Three of these six agents are still with Fine Creek Realty. John Garnder retired and moved to the Florida Keys, Gloria Lathrop retired and is living in Powhatan and Ewell Flippo retired from real easate and is also living in Powhatan. To other agents (Darlene Bowlin and Carolyn Harris) have been with Fine Creek Realty for over fifteen years. Jayme Wood joined Fine Creek Realty in 2006 and is now a partner. 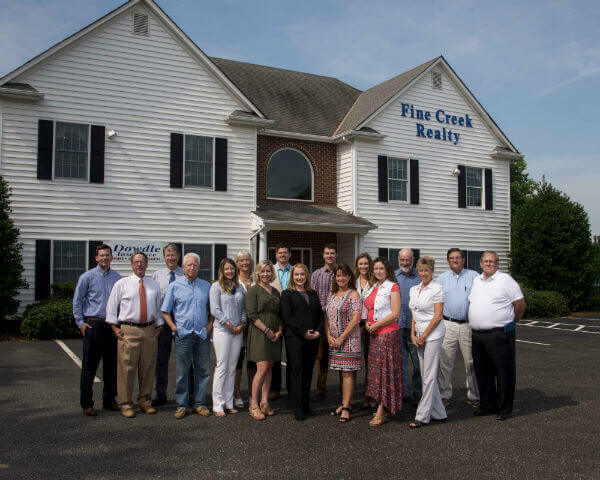 Fine Creek Realty now has 9 experienced agents and is the largest sales force in Powhatan. All but 1 of the 9 agents live in Powhatan, which is where we get our slogan "No One Knows Powhatan Better - Its Our Home". We have a 24 hour live answering service, each agent is equipped with the latest technology for easy access and an office building with high speed internet located at Flatrock in the center of Powhatan.